Ruddy Bits: Dad, Can We Go to the Holiday Storefront Window Dancing thing every year? Dad, Can We Go to the Holiday Storefront Window Dancing thing every year? Looking up past the giant pine adorned with lights, I could just make out the stars through a thin veil of clouds, as remnants of a passing snow shower drifted down, mingling with the steam from my breath as it drifted up. It seemed a peaceful dance. We had missed it, and I didn’t know how. It was supposed to be at 7 p.m., I thought. Yet, somehow it happened half an hour sooner. And, despite my considerable powers as a dad, I had no way to reverse time. Memory acts as a powerful editor, though -- and thank goodness. Just consider the thoughts of some annual event your family attends. If we remembered the way things actually occurred, complete with the emotional angst, mounting tension and complaining kids, we’d never repeat our errors by attending that particular festival, or this annual party, or even the regular vacation destination, ever, ever again. enough to ask for a kitten. Yet the brain has a way of cleaning all that muck up and leaving behind a memory better than the actual event, which in turn draws us back the next year and helps create what become annual family traditions – a huge thing, often, in the mind of a child, or even that of a former child. This time, it will take considerable work if there’s any hope of making this memory as it was intended to be, with a tree, and lights, and falling snow. Yet, I know they will remember it. For the past few years, we – the wife, four kids and I – have spent the first Friday evening in December attending the annual Christmas tree lighting in Cazenovia, N.Y., a cool and quaint village about 15 minutes from our home, with its own lake, a small college, and a main street that serves a picturesque setting for this true community gathering. Cazenovia also happens to be home to my brother and his family. The whole town comes out for this annual event, descending on a large pine tree just a block away from the slew of shops, restaurants, bars and an art gallery or two. Santa always shows up at the tree lighting, too, delivered on a fire truck, to flip the switch. And, then he shuttles off to another location among the shops to take pictures with the kids and hear their wishes. Attending the tree lighting and hanging with the Caz cousins has become something of a tradition for our family. That we’re often scrambling to get there on-time (Friday evenings are tough for us); that we’re usually freezing our butts off waiting for the tree to light; and that we’re always starving and in desperate need of finding a bathroom throughout the event, and many other negative thoughts, all seem to fade in our memories after each annual event, and the kids and us just hold onto how fun it always is. And each year, we go back to see the tree get lit. Next year, I doubt that will be enough of a draw. To keep perspective, nothing really bad happened, and we had a fine time with my brother’s family and some other friends. But the marque aspects of the event – like, say, the lighting of the actual tree – will not be a part of this year’s memory highlight reel. To be honest, nor will the meeting with Santa. No offense to the big guy in red (Though, I hear it was just one of his helpers). Arrived early, ate pizza. Extra time to kill. Husbands walked streets with kids; wives kept warm in restaurant/bar. Got distracted. Santa zoomed by. We hurried for the tree. Fought crowds mysteriously walking other direction. Got separated from two older kids. Fine ... with brother/cousins. Wife still missing. Arrived at tree, it was already lit. Child collapsed in tears. I stared at stars. Gathered thoughts, two remaining kids; found wife; headed for Santa. Fought crowds. Youngest wouldn’t walk, placed on shoulders. Older kids beat us to Santa. Done and gone. Waited 40 minutes. 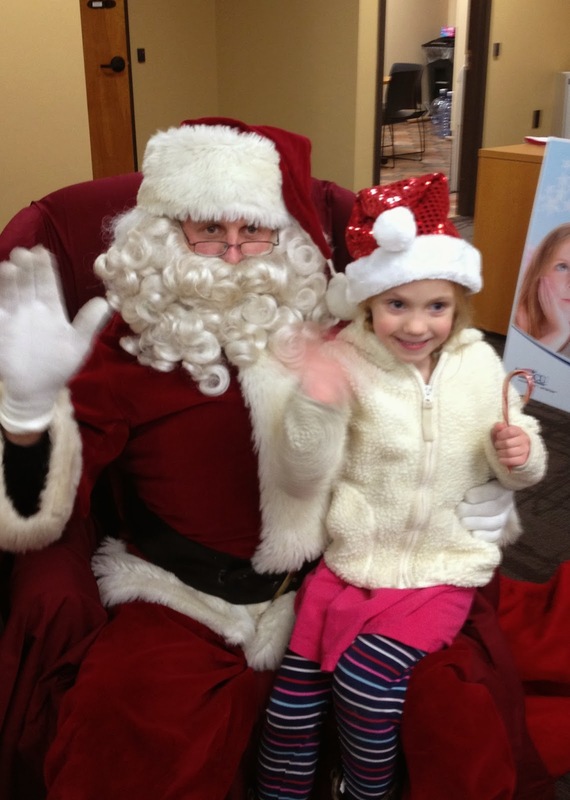 Toddler overtired, refused Santa’s lap. Five-year-old asked for kitty. The ordeal ended when we found our older kids with my brother and their cousins, dancing along main street in front of a particular store. to bust a move ... I swear. 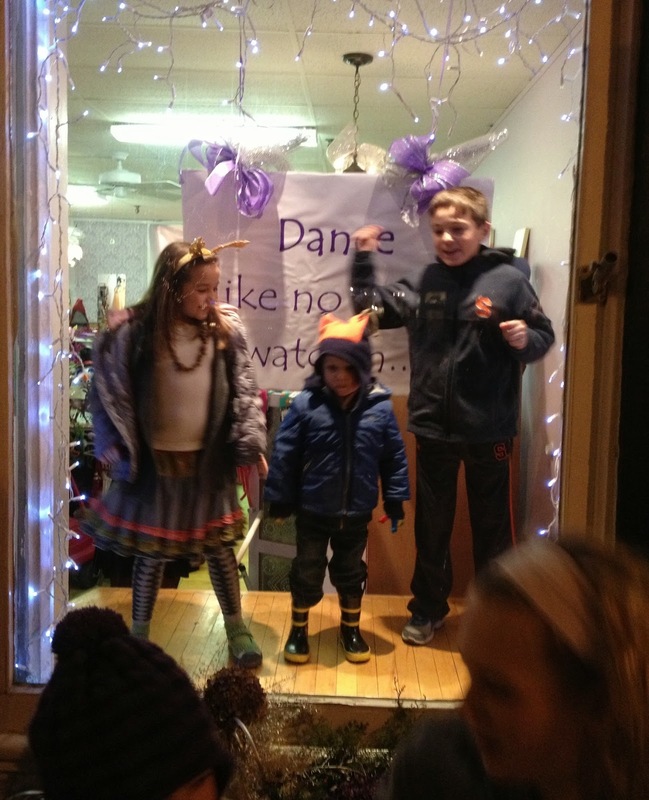 For whatever reason, the store owners were letting all the kids take turns dancing to Christmas music in their storefront window, like a live display in the window at Saks Fifth Avenue. As odd as it was, that store served as the only saving grace of the evening – other than the pleasant company, of course. All the parents gathered around sipping coffees and chatting about how the tree was lit a half hour earlier than expected, as children took turns dancing earnestly in the store window. It was certainly an odd scene, but also a little fun. And as our brains begin to edit, all the tears and frustrations of the night will likely disappear. All the lesson will be learned, and the fun remembered. When next December approaches, I don't imagine anyone will be begging us to go to Caz again for the annual tree lighting or to see Santa. Rather, they'll likely ask for another chance to dance in the store window with their cousins. For that's how new traditions are born – a huge thing, often, in the mind of a child.